Contour pillows are one of the simplest and most effective fixes for neck pain. 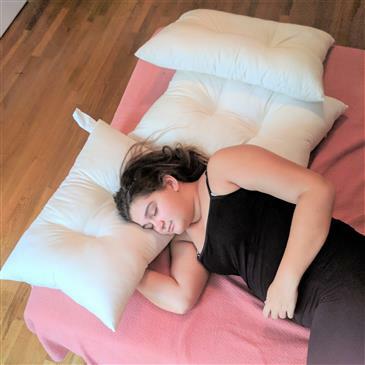 Requiring no prescription pills and no physical therapy, these pillows work to support your neck, while keeping your neck and spine in alignment while you sleep. Putting our warehouse of natural fibers to work, we created the KaPillow, an all-natural contour pillow that is affordable, effective, and completely adjustable. The KaPillow’s design is simple — a soft, organic cotton sateen casing, filled with our natural Kapok fiber. The pillow has a half-seam in the center of it, creating a dip for your head, and leaving a lip on either side to support your neck. To adjust the firmness of your KaPillow is easy — just unzip it, and add or remove filling as you see fit. Getting the firmness of this pillow just right for your individual preference is important to it working properly for you, which is why we made it easy to adjust. The KaPillow is great for anyone looking to alleviate stress on their neck but is particularly perfect for side-sleepers and pregnant women. Simply place the KaPillow in your bed and move it according to where your head naturally falls. You can also use the KaPillow between your legs to help to relieve hip stress, another common problem for pregnant women. Kapok is a natural fiber that comes from the Ceiba Tree in Central America. Kapok fibers come from the trees seed pods, which shed seasonally, meaning there is no machinery required to harvest it. With a silky and fluffy consistency, kapok has the benefits of being fluffy like down, but plant-based like cotton, making it a wonderful vegan down alternative. We just ordered a couple pillows during the last sale. We ordered the contour pillow and a small pillow for my son. We can’t wait to get them. Love the idea that we are sleeping on nontoxic material. This is my first contour pillow but not my first White Lotus pillow. These pillows are amazing, they feel natural on how they mould to my head and neck. The quality is really good and anyone who has neck issues can appreciate being able to adjust the firmness with the added zipper. I use the 2 king sized pillows for my family, who finds them comfortable. Good to know that they are "green" and that I have made a responsible choice. The king sized pillows were so full of kapok that I needed to take some out to adjust for my baby and partner. So now I have extra pillows! I have been looking for a pillow for a long time, and bought organic cotton pillows that didn't hold up their firmness. I love my Kapok pillows. They are just right for me. I love that it is all natural materials and the cover/case is organic. We've been using them for a few years now and have no complaints. Nice product with a different sleeping texture. All products Iâ€™ve bought are for my bed. \nI would recommend the Kapoc pillow and your company to everyone I know. It makes a huge difference to Rest your head on that which is nontoxic. \nI think the quality is excellent! Love this pillow and the fact that it is natural. I love the kapok pillow. It feels terrific. No neck pain, and no toxic chemicals. The kapok pillows are wonderful to sleep on. The kapok doesn't bunch up the way cotton does, and responsibly harvested it is a more sustainable material. We have been using our new Kapok pillows for a week and are very happy with the support and comfort they provide. We have 1 standard medium fill and 1 soft contour with zipper. The contour pillow (with zip) has been especially good. It allows for adjusting the density of the Kapok filling. I deal with neck and shoulder pain and numbness (post MVA accident) The shape of this pillow provides support for my head/neck while not applying to much pressure to my shoulder and ear area. (I am primarily a side sleeper) No other pillow fill has offered the flexibility of the Kapok fiber. I have found the temperature of this pillow to be better as some synthetic fibers and down were too warm for me. We have tried various materials in pillows at different price points. We try to avoid synthetic materials. There was no off gassing evident at all in these pillows. These are the best pillows so far! We hope they last as it has been a long search to get the right product. Although we experienced some delivery problems initially White Lotus Home were very prompt in addressing the problem and they were an absolute pleasure to do business with from my initial order on. We look forward to gradually replacing all of our pillows with their Kapok products! Note: Having dealt with the flu this week and wanting to protect our pillows I found a small hand towel fit nicely between the pillow case and the cotton cover of the pillow. I have used pillow protectors before but found the cotton towel to have the flexibility to match the contour of the pillow. Love our kapok pillows. We always order another one when they are on sale. Every bed in the house now has at least 2 and they are so comfy. I got some of the standard sized medium fill KaPillows, and was totally blown away by how much they helped my neck pain! I'd been having intermittent issues, but after two nights of sleeping on these pillows, I haven't had any trouble since. As another reviewer said, they can be quite firm, which was an adjustment for me, but apparently exactly the support my neck needed. Plus, what's really great about these is I can adjust the firmness by just removing some of the fiber, and passing it off to my husband's pillow, since he prefers his so much firmer. All in all, these are some amazing pillows! The sateen is so soft and silky smooth, and I love that they don't have that funky memory foam smell to them! I got two mediums. I really enjoy sleeping on mine. It's well-constructed and I love the material. The medium is very supportive though, so it is a bit much for my wife, who loves soft, plushy pillows. Luckily this pillow has a zipper to allow for the removal of some of the kapok filling, so she's experimenting with that. Are the kapok pillows treated with a flame retardant? Are any of your pillows treated with a flame retardant?